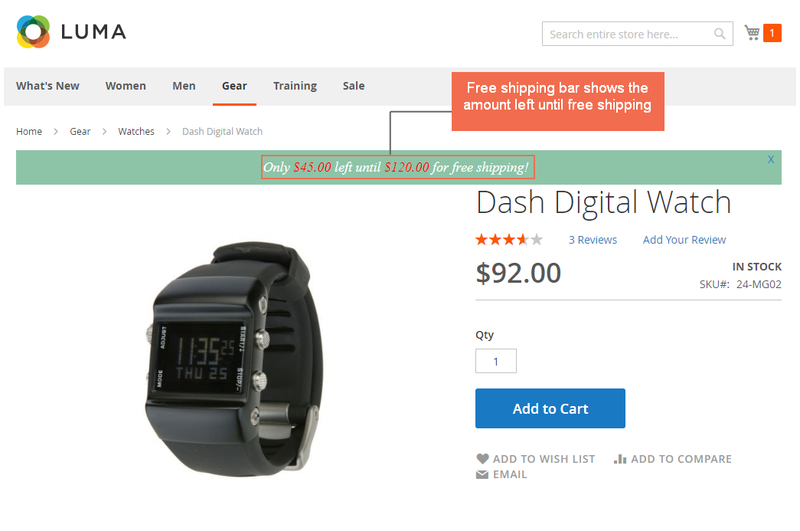 Display a Magento 2 free shipping bar to show the amount left until free shipping. 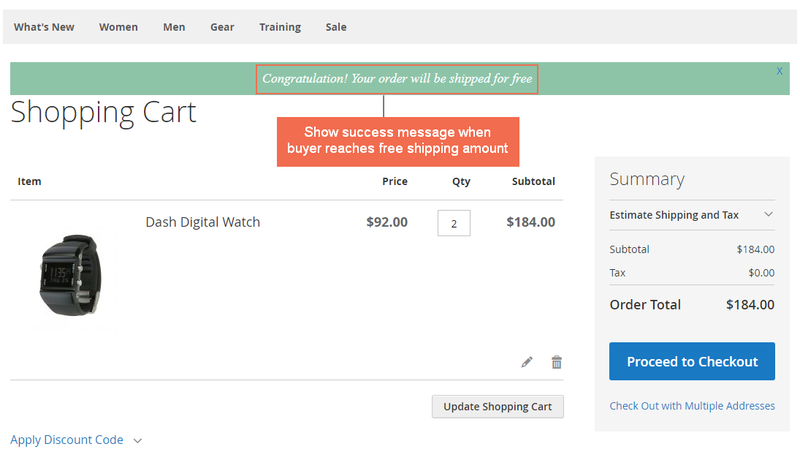 Customize Magento 2 free shipping amount and message for each store view and currency. Display free shipping bar on multi places in the store: Homepage, product page, category page, etc. Show success message when buyer reaches free shipping amount. 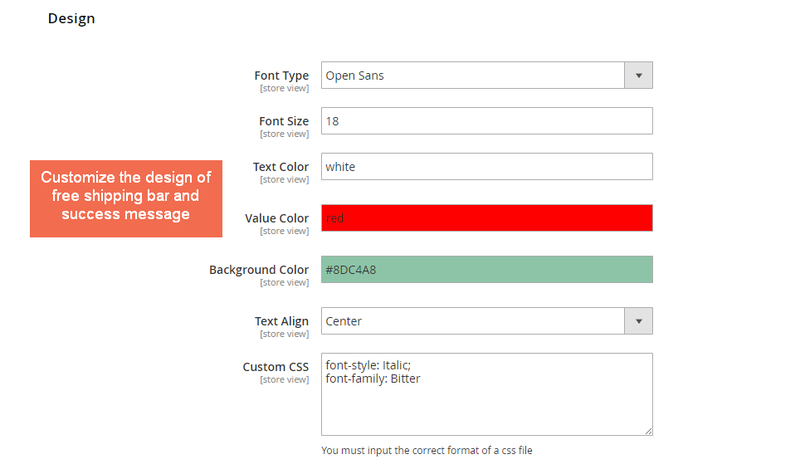 Customize fonts and color of the free shipping bar and success message. Everyone loves free shipping. And Magento 2 Free Shipping Bar will help you present your free shipping policy to buyers in a compelling and irresistible way. Don’t miss the chance to deliver one of the most purchase-triggered strategy by these amazing features of Magento 2 Free Shipping Bar. The notifier will be displayed in form of a free shipping message bar. It informs customers about the minimum cart total to get free shipping and the remaining amount until they reach that limit. For example: “15$ left until 89$ for free shipping”. Regularly, store owners often set a pop up to remind buyers of this program. But we all know how quickly it is closed before anything can be read. With Magento 2 Free Shipping Bar, we make sure your message is conveyed to buyers at any places you wish on your store. At the configuration of Magento 2 Free Shipping Bar extension, admin will set up a goal for freeshipping. The extension will do the rest and calculate customer’s remaining amount automatically. If the cart total is changing, the amount left number in the free shipping bar will be re-calculated. At the backend, admins are freely to choose to include/exclude tax in the displayed subtotal on the message bar. Display free shipping bar on multi places in the store: Homepage, product page, category page, etc..
Magento 2 Free Shipping Bar extension allows admins to put the bar in any places including: homepage, category page, product page, search result, cart page, checkout page. You can set the free shipping bar to be visible anywhere buyers go as an important reminder. To give store owners more choice of customization, Magento 2 Free Shipping Bar extension enables admins to change fonts and color of both message bar and free shipping success message. Now, you can have an effective free shipping bar in terms of content and style. It’s time to say goodbye to the ineffective popup to inform your free shipping policy. Buyers need something more powerful than that. And urge and repetition is what make Magento 2 Free Shipping Bar the perfect solution for your message to be embed in customer’s mind. Free shipping policy is one of the most traditional and yet effective way to boost sale. Not many buyers can say no to free shipping. Hence, they often try to by a bit more to get that goal. And you will see the significant increase in your sale number from that. Free Shipping Bar features is nice but settings were a bit complicated for me so I contacted BSSCommerce's support team for help. They responded right away and was really useful! Definitely come back for more installation. I was running a small promotion for the 3 year anniversary of my site recently. Using the free shipping bar as a message for the free shipping and the promo at the same time. Customers seem to notice about the promo more that usual. The sales was very impressive. Nice extension!